Summary: Development Alternatives has prepared a toolkit on 'Participatory Village Energy Planning' with the support of Heinrich Boll Foundation (HBF). The toolkit is essentially meant for Non-Governmental Organization (NGOs) with the main objective to provide them with guidelines on different aspects of community based renewable energy initiatives in rural areas. Summary: The social audit toolkit provides pratical guidance and insights to its users working in governmnet departments, community organizations and civil society groups for using social audit as a tool to identify, measure, assess and report on the social performance of their organizations. This toolkit has been designed keepng in view the needs of non-specialists interested in conducting social audit. 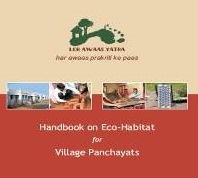 Summary: This handbook is the result of a manthan or assimilation of lessons that were generated during the two-year-long Lok Awaas Yatra initiative of basin-South Asia Regional Knowledge Platform. Summary: The handbook aims to improve training capacities of NIRD and non-governmental expert agencies for awareness-building and skills-training of the newly elected Panchayat members. It focuses on the training of elected local officials in two key institutions of Panchayati Raj – the Gram Sabha (body comprising all registered voters in a village) and the Sarpanch (head of the elected village council). The handbook modules were field-tested in India in collaboration with selected stakeholder groups. Summary: This manual is a five-day capacity building programme covering methods and sources of obtaining data on various development sectors of demography, reproductive and child health, education, poverty, drinking water and sanitation. The last section on monitoring and evaluation sums up the amenable indicators or their proxies that can be monitored or tracked at the district level. The course design includes hands-on practice and software for estimating various indicators using indirect demographic techniques. Summary: The IDP Training Module is based on Decentralized district planning and the modules set primarily contains three modules: 1) for master-trainers; 2) for officials/elected representatives who would anchor the process at the district level; 3) for resource persons who would be working as technical support groups.